Tortoises, or land turtles, are one of the most popular reptile species which are keep as pets. Nowadays, we have a bit more knowledge about these unusual animals, which allows us to take the best care of them that we can! Tortoise species which are kept domestically, typically have lifespans of 60-80 years. Lifespans differ between species. As previously mentioned in my Reptile Awareness 2015 post, reptiles are endothermic (cold blooded) and need to bask in the heat, to absorb heat, to get moving! A heat source needs to be fitted in the vivarium (enclosure) for this purpose – but at one end of the vivarium, and far enough away from the other end, that your tortoise can move into a cool spot when it likes. The natural source of heat is the sun, which naturally also provides UV, in a domestic environment, in the vivarium, a UV bulb should also be fitted. UV is a good source of vitamin D which aids in shell and bone development and growth. Without adequate heat and UV, your pet may become ill, or worse. On a personal level, I would not recommend heat rocks or mats for any reptile species, as these can get very hot – if the animal is lay on a heat rock or mat when it’s too hot, it could cause harmful burns. Before looking into diet, you need to know if the species of your tortoise is a herbivore or a carnivore. If it is a carnivore, ensure you know what you can and cannot feed your pet – including sizes (likely food source will be pinkies (newborn mice)). Most pet tortoise species (at least, that I have had the pleasure of caring for since I was 16) are herbivores. As with any herbivorous animal, you need to know what fruit and veggies and other greens are safe to feed your tortoise, and which are not! 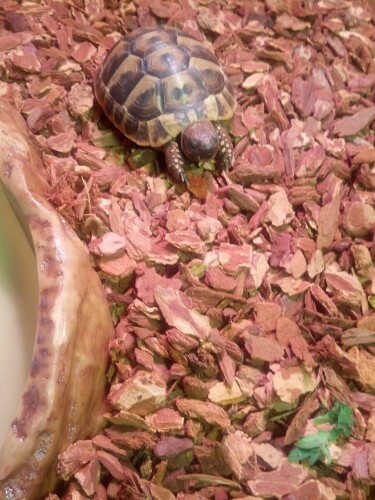 Also, pellet foods supplement a diet vegetables and fruits and other greens; the pellets are filled with balanced nutritional requirements suitable for the tortoise species. The diet should also include fibrous plants like grasses and weeds. Good greens, veggies and fruits include white nettle, dandelion (flower and leaves), corn poppy, apple, chickweed, bindweeds, chicory, clover, heather, sow thistle, rose petals, fuchsia, nipplewort, peach, clover, grape, honeysuckle, bittercress, melon, blackberry, raspberry, knapweed, leafy salads, lettuce, apricot, watercress, curly kale, brussel tops, dahlia, spring greens, pumpkin, coriander, parsley, rocket, carrot, parsnip, strawberry, carrot, tomato, kale, courgette, cabbage, and bell peppers. Leafy greens should be the bulk of the vegetation. 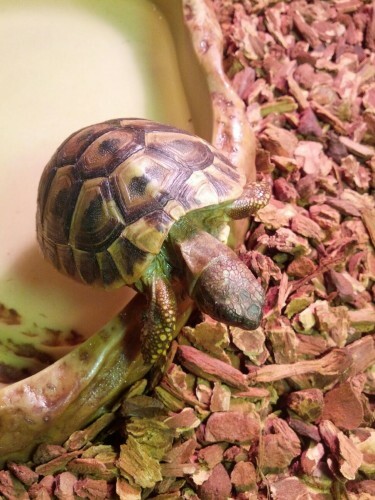 Don’t forget to provide fresh water daily for your tortoise, don’t put the water bowl under the heat lamp, to ensure your pet has cool water to drink. 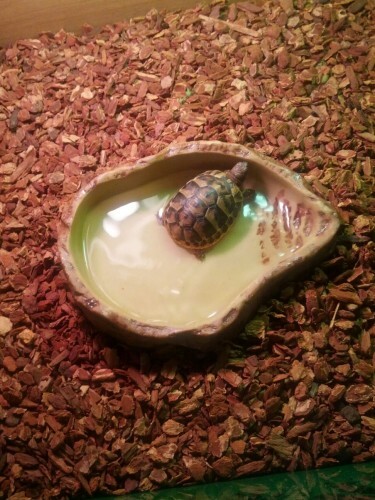 Tortoises like to bathe too, and will often sit in their water bowl . 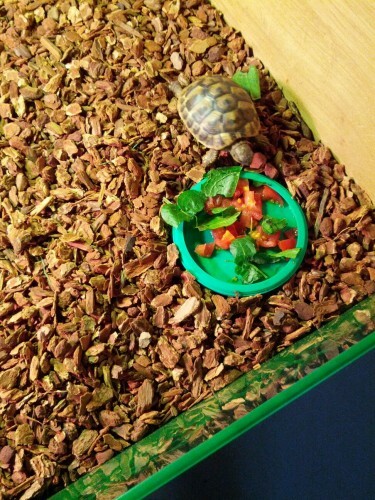 The best types to buy are the bowls with ramps/staggered sides to enable your tortoise to easily climb in and out – not that they will always use the ramp! Often they will bathe themselves when they are shedding (they shed in bits like a lizard, not all in one like a snake), to help remove dead skin and relieve itching. Tortoises have always been quite popular, however, some things that previous generations have done with their pet tortoises, were (unknowingly) not in the best interests of the animal… Such as, painting the shell – this is a big do not as the paint can block the air holes in the shell, and cause suffocation. Some tortoise species will go into hibernation during the winter months, they will wake come spring-time – your pet is not dead, and does not need to be buried or disposed of!